The Complete Rod Taylor Site: Dinah! 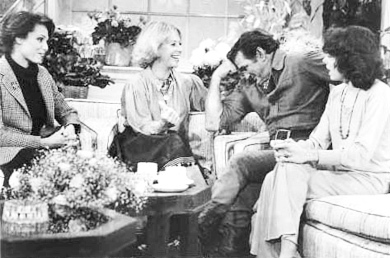 Rod Taylor flexed his muscles during his appearance on "Dinah!" -- a syndicated 90-minute daily talk show. Rod came to the show fresh from the set of "The Oregon Trail" to join hostess Dinah Shore and her guests. The other guests included actresses Valerie Harper ("Rhoda") and Mackenzie Phillips ("One Day at a Time"), pictured below. Also appearing on the show were actor/singer Paul Nicholas, co-authors Richard Corriere and Joseph Hart ("Dream Makers: Discovering Your Breakthrough Dreams"), and consumer advocate David Horowitz. Rod and Dinah were linked romantically in the late 1960s and also had the same manager, Murray Neidorf. 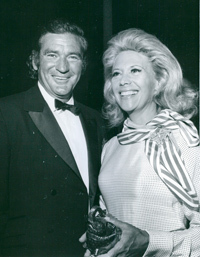 Rod Taylor with Dinah Shore at a movie premiere in 1970. Thanks go to the Dinah Shore Fan Club for sharing info and the image on this page.